Rebecca Lucario is recognized as one of the top Pueblo Indian potters. She says that she loves making pottery, because "it makes me create and use my imagination." Rebecca is the daughter of Katherine Lewis of Acoma Puelboand sister of Carolyn Concho, Marilyn Henderson Ray, Judy Lewis, Diane Lewis, and Bernard Lewis. The quality of her pottery is exceptional in form and design. She has won numerous awards, including Best of Division and Best of Show at the Santa Fe Indian Market (1991, 1994, 2000) and the Gallup Inter-tribal Indian Ceremonial (2000). She is best known for two styles: Mimbres Revival pots covered with animal designs, and Optical Eye Dazzlers. Her work is highly sought after by collectors. This small jar, a little over 2 x 2 inches, was made in the year 2000 and entered in competition at Santa Fe Indian Market that year. The current owners purchased it directly from the artist at that year’s Indian Market. It had been awarded a Second Place ribbon by judges, Bob Andrews. Charles King, and Jody Folwell. The jar is a traditional olla shape from Acoma and features traditional Acoma designs of the period. 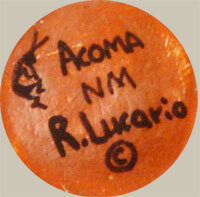 It is signed Acoma N M R. Lucario on the underneath. Condition: very good condition with a single spall mark that has been filled and painted. 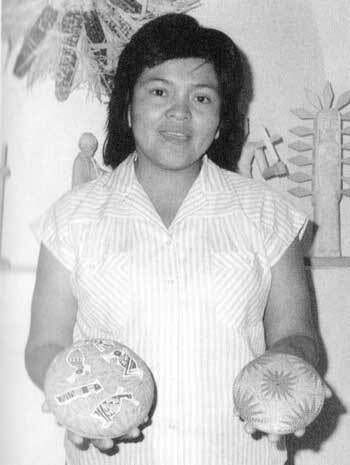 Artist Image Source: Southern Pueblo Pottery: 2,000 Artist Biographies by Gregory Schaaf. CIAC Press, Santa Fe. 2002. Artist image courtesy of John D Kennedy, Georgiana Kennedy Simpson and Gregory Schaaf.